Xiaomi Mi 20000mah Powerbank Review . Mi 20000Mah Powerbank Review . 1 Mi 20000Mah Powerbank Review . 1.1 Xiaomi Mi 20000 MAH Powerpack Review and Unboxing . In the Review of Mi 20000mah powerbank we will discuss all the basic details and actual capacity , actual backup of the mi 20k powerbank . Mi 20000mah powerbank is the latest powerbank from xiaomi and also the biggest yet . Xiaomi is undoubtedly a emerging brand in the whole world and also the world’s 3 biggest brand . One of the main reasons why xiaomi is popular is the affordable price tag they offer in their every products from flagship Mi 5 to Usb Light . Xiaomi launhced the 20000mah powerbank on 6th april along with the Mi 5 and surprisingly the powerbank was sold out in just 2 seconds . With such huge capacity xiaomi claims that the powerbank can even charge a macbook for 1.5 times however the actual performance can only be checked after the real usage of the Powerbank .So today we are here with a Xiaomi mi 20000mah powerpack review . Xiaomi Mi 20000 MAH Powerpack Review and Unboxing . So starting with the Review of Xiaomi 20000Mah powerbank . Xiaomi mi 2000mah powerbank is made with Panasonic And Lg high density cells . One of the best thing about this powerbank is that it supports fast charging which means the with just 3 hours of charging you can half charge ( 11000mah ) the battery of powerbank . Xiaomi is known for their premium aluminum material made powerbanks but this time with the largest powerbank they have changed the material to high quality plastic . The xiaomi mi20000 mah powerbank comes with a white color plastic with some kind of texture on it which helps to make grip . When asked for the reason behind this xiaomi they said that plastic decrease the weight of the powerbank which makes it easy to carry plus plastic also helps keep the powerbank remain cool . One of the biggest doubt every powerbank user have is that why they dont get the Full mah mentioned on the pack from their powerbank ? So the answer is the capacity + Charging + Output of a powerbank depends on many factors like Temperature pressure . However as we already mentioned earlier that the capacity depends on many other factors so it may ( may not ) vary . 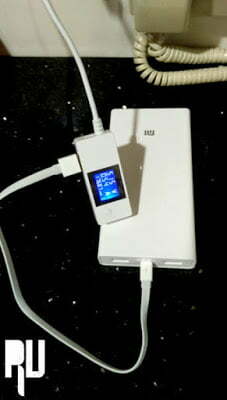 So next time when you buy a Powerbank dont get confused with the actual capacity and listed capacity of your powerbank . 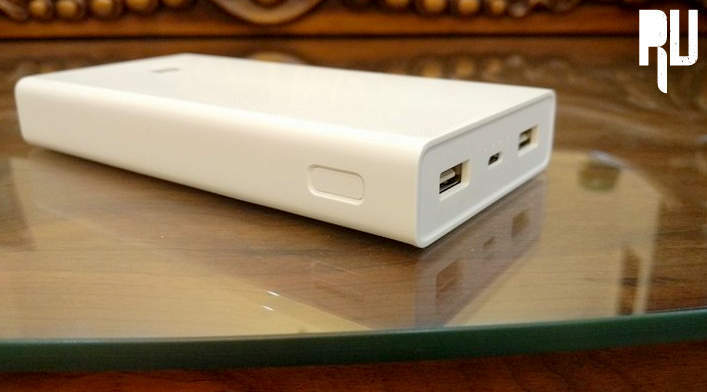 In the previous version of xiaomi powerbanks we have seen a big round button to check the charged percent or to on and off the powerbank but this time there is a rectangular button placed on the top side of the powerbank . The charging ports are now placed in bot the corners with face at same side which can be helpful in some cases but not for all . The Length of charging cable has been increase which is seriously a major and good upgrade . Rest everything is same . The powerbank needs approx 7-8 hours to get fully charged . Being a such huge powerbank this time is acceptable . In this review of Xiaomi mi 20000 mah powerbank we discussed about the build quality and many more things about the powerbank . So if you want a powerbank that comes at affordable cost and can charge your smartphone full for 5-7 times then the mi 20000 mah is the perfect choice for you . So this was our Xiaomi mi 20000 mah powerbank review i hope this review on the Mi 20000mah powerbank helped you .